Roll up some fun! Little hands are the perfect size to make these meatballs. 1. PREHEAT oven to 400°F. Mix meat, cracker crumbs, Parmesan cheese and 1/4 cup of the spaghetti sauce in medium bowl. 2. SHAPE into twelve meatballs, using about 2 Tbsp. meat mixture for each. 3. PLACE 2 inches apart, in shallow baking pan sprayed with cooking spray. Press 1 cheese cube deeply into center of each meatball. 4. BAKE 14 min. or until meatballs are cooked through (160°F). Meanwhile, microwave remaining 1/2 cup spaghetti sauce in small microwaveable bowl on HIGH 30 sec. or until heated through (adult assisted). 5. WASH UP. 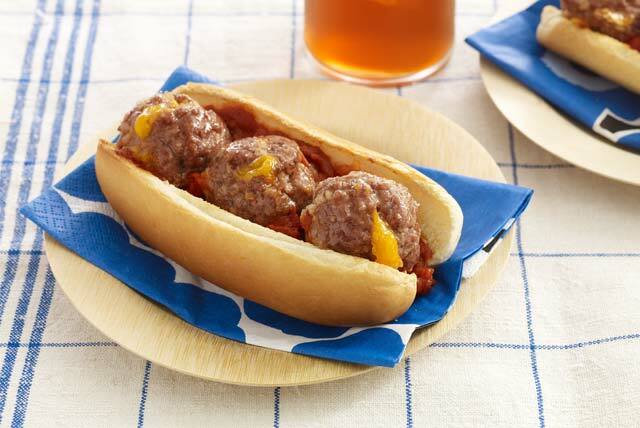 Making meatballs is hands-on work, so put food safety at the top of your to-do list. Keep things clean by washing your hands before and after this recipe.